"My wife goes there and they've been super-nice, even adjusting their hours." "If you're looking for optimal health, you should be visiting Mission Bay Chiropractic." "Dr. Chuck is as good as they come." "...you can feel that he truly wants to make you better." "Dr, Yuen is the epidemy of professional"
"I've been going to here for the past 2 years and highly recommend it." "The staff at Mission Bay are friendly, organized and prompt. " "Katy and Dr. Wayne are both awesome they really care and try to help me feel better." "All in all, you'll walk away feeling more relaxed and with less discomfort!" "I guarantee if you choose Mission Bay Chirpractor you will be on the road to recovery!" Mission Bay Chiropractic strives to make a positive difference in the health of our patients in need. By providing thoughtful guidance towards achieving each patient’s wellness goals, we hope to empower others with beneficial knowledge about their bodies and well-being. We at Mission Bay Chiropractic make it our mission to facilitate the natural healing powers of the human body. We endeavor to motivate and inspire our patients to take an active role in their health. As chiropractors, our goal is to help you achieve maximum wellness by restoring the natural movement and alignment of the body. We pride ourselves in providing our patients with gentle and precise chiropractic treatments. Your wellness care may include stretching, deep tissue work to break up adhesions and scar tissue, heat, ice, home exercises, nutrition (cleanses, vitamins, supplements, etc.) and ergonomic postural awareness. Every body is unique and has different health concerns therefore we will tailor a wellness plan that best suits you and your individual health needs. We have multiple Certified Massage Therapists on staff who are happy to guide your body on a path to natural wellness. Currently our office offers Massage Therapy primarily in hour-long sessions. Our therapists specialize in treating sports injuries, office-related repeated stress injuries and everyday wear and tear. Our trigger-point massage techniques positively affect the muscular, skeletal, circulatory, lymphatic, nervous, and other systems of the body. The treatments we offer at Mission Bay Chiropractic are deep tissue in nature, in order to relieve tension in the body and allow healing to begin! 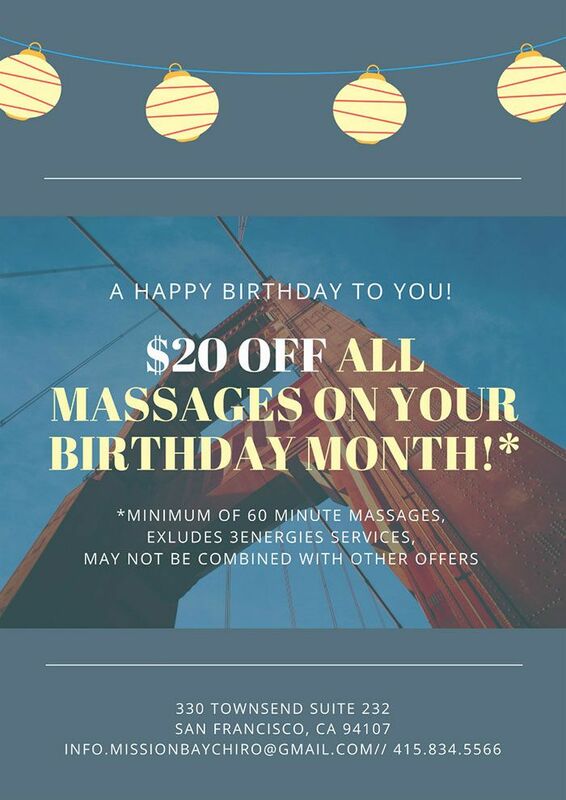 Ask about additional session time and our special Massage Care Package, now available! "Katy and Dr. Wayne are both awesome - they really care and are trying to help me feel better permanently. Dr Wayne even came to my office to do an ergonomic evaluation"
"Every time something comes up, the first thing I do is book an appointment with Dr. Chuck. He is very patient and attentive, and he really knows his stuff." "It only took a handful of appointments to feel better, but it was nothing short of amazing. HIGHLY RECOMMENDED!" "I have been to many many chiropractors and massage therapists in my day, and Dr. Wayne and Gina are literally the best I've ever had." "Dr. Wayne rocks. No other way to put it. After severely injuring my back six months ago I was in pretty much constant pain and discomfort since. " "So fun to come into this office. Not only are the chiropractors knowledgeable and address body imbalances, the staff is wonderful!" "I came in with the worst upper neck pain, hardly able to move and he fixed me right up. 100% would recommend. Will definitely be back." "Dr. Chuck is an exceptional chiropractor. He helped me reduce significantly the frequency and intensity of my migraines and tension headaches." "Dr. Chuck was so understanding and gentle, he explained every move before he did it, and made sure it was as painless as possible." "The entire staff is friendly and helpful, too. You can tell they all care for their clients' well-being." "Dr. Chuck is fantastic! He really got me back in shape. He's very attentive, and listens to your concerns. He taught me stretches to strengthen my back at home." "Dr. Chuck delivers top-notch care, and is easy-going and approachable. The office staff is super, too! You can't go wrong with Mission Bay Chiropractic." "Dr. Wayne got me back into high heels and I no longer walk like an ape!" "Tried out chiropractic care here after reading positive Yelp reviews...I went from barely walking for two days to several days with almost no pain." "He even went to my office desk and did a free workstation guide for me. Overall, it is a great experience collaborating with chuck." "This office has a very friendly and knowledgeable staff who genuinely want to get you healthy. Nice clean office." "I go to Dr. Chuck Affatato, who has kept me dancing , and free from back pain for a number of years now. He is a very good chiropractor, and he listens to any concerns"
"Best and professional service. Dr. Wayne is caring and makes sure that he addresses all concerns." 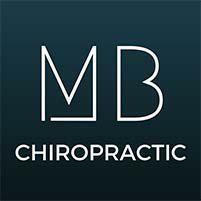 "Mission Bay Chiropractic is a top notch clinic! Dr. Affatato and Dr. Yuen truly care for their patients health and well being. I would highly recommend this clinic!." "I can't thank Dr. Chuck enough for the expert adjustments that put my SI joint back in its proper alignment." "I've been seeing Dr Wayne for three months. Before coming in I had trouble walk/sitting/laying down. My lower back felt like hell, now it feels great!"